Jeffrey Dahmer is literally one of the most widely recognized names in all the world, and for good reason (not simply just because he was a serial killer). It was his cold and methodical execution of his premeditated plans to do awful, unimaginable things to innocent people. He butchered, murdered, raped and desecrated corpses for many years. Not to mention the fact that he occasionally ate some of his victims body parts. This earned him the appropriate nickname “The Milwaukee Monster” and “The Milwaukee Cannibal”. His name was publicized worldwide, he had books and movies written about him, and like staring at a train wreck most people just not take their eyes off of this asinine discovery. His first known kill was Steven Hicks in 1978, the same year Dahmer graduated high school. He was active for a long time after his initial kill, and wasn’t actually tried before a jury until 1992. In 1994 he was beaten to death in prison by an inmate named Christopher Scarver. None of this is in the movie at all, just wanted to give you a brief background with facts. Now with so many documentaries that have been made, made for TV movies, and direct to DVD releases – there has been no shortage on video of Jeffrey Dahmer. The most recent (prior to this) and success was released in 2002 starring Oscar nominee Jeremy Renner. 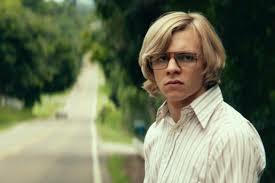 It’s been a long time since I have seen this movie, and I should have watched it again prior to writing this review but Im here to talk about My Friend Dahmer (2017) and not the 2002 aptly titled “Dahmer”. I had seen the trailer for this movie a few weeks, if not months ago and it actually looked very well made, put together and interesting. This is a very different movie from the other one I mentioned from 2002. This movie focuses strictly on Dahmer’s home life, his fascination with road kill and dissolving dead animals in acid in a homemade “laboratory” inside a shed in the woods behind his property. Immediately after we are introduced to our “anti-hero” if you will as the film’s star and primary focus, one cant but admire the apparent effort that went into this. From the sets, styles, clothes and atmosphere of the 70’s it truly feels authentic. Directed and written by Mark Meyers (who has only a few films under his belt, none that I am familiar with), I have to say he did a fantastic job especially given the subject matter. As soon as the movie starts and we are introduced to young Jeffrey, I felt drawn in knowing I had to finish it. As I said before, this movie takes an entirely different and unique approach to the subject matter – it follows a young Jeffrey Dahmer in high school and the apparent hardships he experienced from his parents constantly fighting, to being bullied in school, to feeling like an outsider and realizing he just might be a homosexual. If you are looking for gore, even a small amount of blood then again this isn’t the movie for you. There is none to be had unfortunately. However, this is a character study and driven movie. 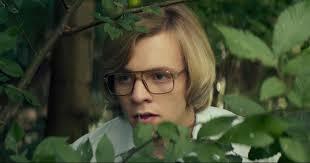 Ross Lynch who plays Jeffrey Dahmer was absolutely fantastic in this role. I had never heard of him or seen him until this movie, and after a little IMDB action it appears he was some sort of Disney star. He absolutely nails his appearance, and even more so his odd behavior and quirky (creepy) demeanor. He has an innate shyness and defect of character from the start. Towards the beginning of the movie we see him pick up a piece of road kill (his favorite hobby) as two kids ride up on bicycles and ask him what’s in the bag. He shows them and tells them about his plan to dissolve it in acid. Not believing his story, his fellow teenagers follow him to his shed laboratory and realize he isn’t kidding. They ask him why he does it, and he tells them he likes to know what the insides look like and has a thing for bones. Clearly creeped out, the kids call him a freak and peddle away. After a while of doing this and having absolutely no friends whatsoever, his father decides he has had enough and demolishes the shed and tries to talk Jeffrey into making friends. He brings him home a set of dumbbells and hopes that he will get interested in working out and eventually girls. Wishful thinking pops! In school he is normally invisible but decides to start making a fool of himself by “spazzing out” at the most random times. This behavior quickly attracts the attention of 3 male students who are close friends and they invite him to join them for lunch and start hanging out. This goes on for a while, but the group begins to realize that Jeff is not like them at all, or anyone else for that matter. They aren’t sure what to make of him, and initially feel bad and kind of pity him. The more they all hang out though, the more they realize there is more to it than that. Jeffrey tries to control his impulses, attempts to stop picking up road kill but can’t quite lose his fascination with death, internal organs and structures of animals. It appears he has a semi-normal childhood and upbringing, complete with family dinners and a father trying to get through to him. His mother (played by the talented Anne Heche) is crazy, recently released from a mental hospital after chasing down what she thought was a UFO. All his mother does is pop pills, drink, make bad decisions and start problems with the entire family, especially her husband. Eventually when his father can take no more, he decides to move out and into a motel to salvage what’s left of his life and move on from his crazy and selfish wife. Seeing as a divorce between them is only a matter of time, Jeffrey starts to drink very heavily. This surprises and worries his newfound “friends” who already are trying to distance themselves from him out of being uncomfortable around him and feeling bad that they are the reason he makes a fool of himself running through the school and mall “spazzing out”. The worse things get behind closed doors, the darker Jeffrey becomes and the more he starts giving in to his impulses, a few already in his mind beyond just animals. Overall, this was a solid movie and worthy addition to your collection of DVDS. Keep in mind, like I said if you are planning on watching this strictly for the gore and shocking details that Jeffrey Dahmer was known for then you are in the wrong place. Instead, this is a look at Jeff’s early life and high school years, and a very character driven study and story. Overall the movie is slow paced, but the performances (especially the lead) make it extremely easy to watch and want to know about this time in the life of one of America’s most prolific serial killers. I can certainly see a bright future for lead and star Ross Lynch who clearly did his homework and then some, and writer/director Marc Meyers if he doesn’t try to sell out by catering only to the blockbuster crowd. Very well made, informative, entertaining and immersive film.